Northumberland’s many myths, legends and centuries old traditions? In a county with such along history of human activity and moody and dramatic landscapes, hidden nooks and crannies, Northumberland is a land of legends, and even some ghostly goings-on. Here’s why: “The Lang or Long Pack” is Bellingham’s very own murder mystery. In St Cuthbert’s churchyard is an odd looking tombstone, reputedly the grave of a robber pedlar shot by a local ploughboy whose suspicions were raised as to the contents of a curiously-shaped pack left at nearby Lee Hall. Bellingham’s Heritage Centre is the perfect place to learn more, including the real life horror stories of the medieval Border Reivers (raiders) and the Charlton Spur legend. Here’s why: Visit the tiny hamlet of Simonburn, south of Wark (detour) for a step back in time or view Roman archaeology at Brunton Turret on the A6079 near Chollerford. Hadrian’s Wall is connected with Arthurian legend and King Arthur, Queen Guinevere and their court are reputed to lie in enchanted sleep on the Wall near Sewinghsields crag. In 634/5AD King Oswald of Northumbria defeated the heathen Cadwallon in battle on this site. The night before the battle Oswald raised a wooden cross (a replica can be seen in the lay-by at the site) and prayed for a “heavenly victory”. Which came his way the next day. Here’s why: Pass the historic site of Dilston Castle and Chapel once owned by “The Bonny Lord”, James Radcliffe, 3rd Earl of Derwentwater (1689- 1716) who was executed on Tower Hill in London for his part in the Jacobite Uprising of 1715. Here’s why: Discover what “Lord Derwentwater’s Lights” were, gaze down on the “Devil” from the Lord’s Bridge on an easy walk through the Castle grounds. Here’ why: Blanchland is entirely owned by The Lord Crewe Trustees, a charity established in 1721 by Nathaniel Lord Crewe, Bishop of Durham. The village was previously owned by the family of the Bishop’s wife, Dorothy Forster, whose nephew was General Tom Forster (1683-1738), cousin of James Radcliffe, Earl of Derwentwater and co-leader of the English Jacobite army of 1715. The ghost of Tom Forster’s sister, also called Dorothy, haunts the Lord Crewe hotel, the former family home, as she waits in vain for her brother’s return from exile. Hotel guests even claim to feel the weight of her presence on their bed! 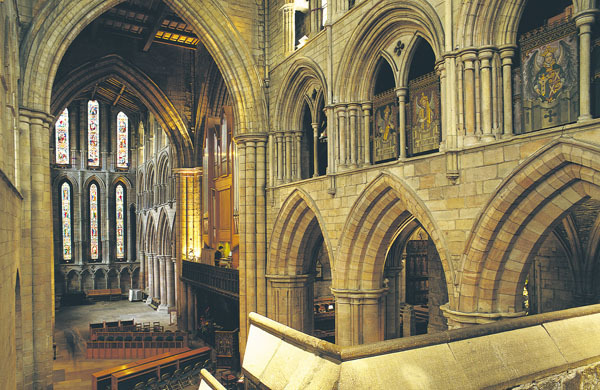 Here’s why: There is nothing horrid about Hexham Abbey. Beauty, peace and tranquillity are assured. But the Abbey has some reminders of human frailty. Misericords (“Lord have mercy”) are special choir stall seats designed to help the medieval Augustinian Canons of Hexham Abbey stand upright during long church services. Rich carvings on the seats include a Green Man with leaves pouring from his mouth. And the Abbey’s “Dance of Death” painted wooden panels remind us all that death can visit anyone at any time. Northumberland National Park’s Hareshaw Linn (waterfall) at Bellingham - is listed in the Top ten Autumn walks around Britain.